- J-America Adult Premium Fleece Hooded Pullover. - 10.0 ounce 80/20% ringspun cotton/ polyester fleece fabric. - Spandex blend rib waist and cuffs. 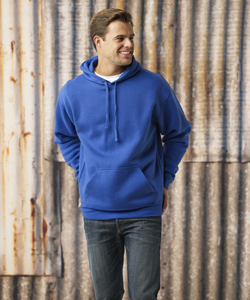 J-America Adult Premium Fleece Hooded Pullover. 10.0 ounce 80/20% ringspun cotton/ polyester fleece fabric. Jersey lined hood. Spandex blend rib waist and cuffs. Front pouch pocket. Coverstitched throughout. Sizes: S-3XL. Colors: Ash Heather, Black, Charcoal Heather, Navy, Oxford, Red, Royal.